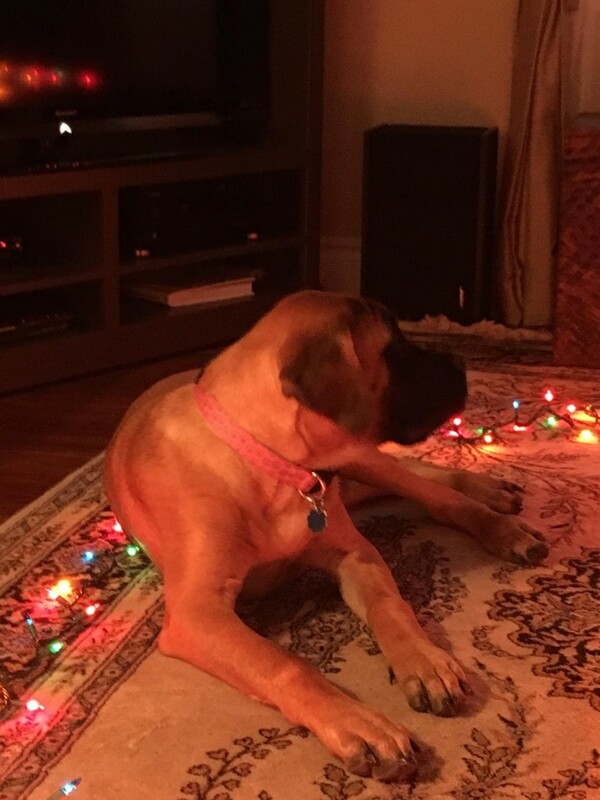 Destructive 1 yo English Mastiff - This Forum is brought to you by The Mastiff Sweet Spot and Friends of the Forum. Is it common for a 1+yo English Mastiff female to be destructive to the point of eating wooden chairs, walls and anything but her toys? Unfortunately, this is not uncommon. Here are my suggestions: First, make sure she has bones to chew -- preferably weight-bearing bones with marrow. These are available (and inexpensive) through most butchers. Second, ensure that she gets sufficient exercise (old adage, "a tired puppy is a good puppy" -- and at one year yrs old, she is still very much a puppy). Simply letting her out in the yard, for example, simply won't suffice. You should take her for one to two walks per day. We walk our Mastiff (and other giant breed) puppies for approx. 1 mile at 1+years old. Just keep in mind that their growth plates don't close until 18 months, so you don't want to over-stress them. Holding short training sessions during the course of the day (using positive reinforcement) can engage your puppy mentally and stave off boredom. When she is alone, unsupervised in the house, it is a good idea to crate her -- or (what we do in my household) "puppy proof" a room, ensure she has a bed, toys and bones, and prevent her from leaving with a child or dog gate.